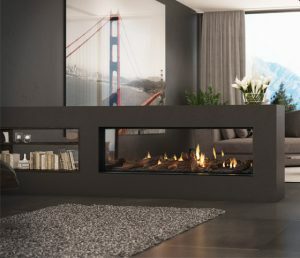 Individuals who are going to invest in a gas fireplace want to be informed about its capabilities. There are a lot of myths when it comes to gas fires. Knowing what these myths are will help you avoid making a mistake when purchasing. Often, individuals figure that if they buy a bigger gas fireplace, the better it is when it comes to heat. The experts suggest that someone purchases a fireplace according to their heating needs. There is no point in having a large BTU gas fireplace in a small room that doesn’t require it. There are some that believe they are getting more value if they buy a higher BTU gas fire. What the focus should be on, instead of this myth, is the reality of one’s requirements. An individual wants to buy a gas fireplace that is going to produce good heat for the size of the area that needs heating. Plus for the ambiance, this type of unit can create. They want a realistic looking a fire. Another myth is that one should buy a gas fireplace with an over-sized heater. Then all they have to do is use the thermostat to control the amount of fuel that is being provided. This is another myth. Some units are only made with the thermostats that will allow for one rate control, whereas others may allow for a variation in rates. There is a myth that one should always buy a gas fireplace that has a fan, on the belief that it is going to distribute the heat more. What has to be remembered is that the fan moves the air, not the heat. If the heater is of the proper size for the room being heated, there should not be a requirement for a fan.